Yogi Berra once said, “It’s hard to make predictions, especially about the future.” And nowhere is this more true than in the water business. Forecasts are extremely important for water utilities, which must make plans today to meet their communities’ current and future water needs. Since water supply projects can take years to plan and build, utilities’ long-term view often reaches twenty years or more into the future. But the industry has a poor track record when it comes to long-range forecasting. The results of this are not purely academic. The end result is that water utilities may build unneeded or oversized water supply and treatment infrastructure – things like reservoirs, pumping stations, treatment plants, and desalination facilities – passing on the costs to customers and creating unnecessary environmental impacts. 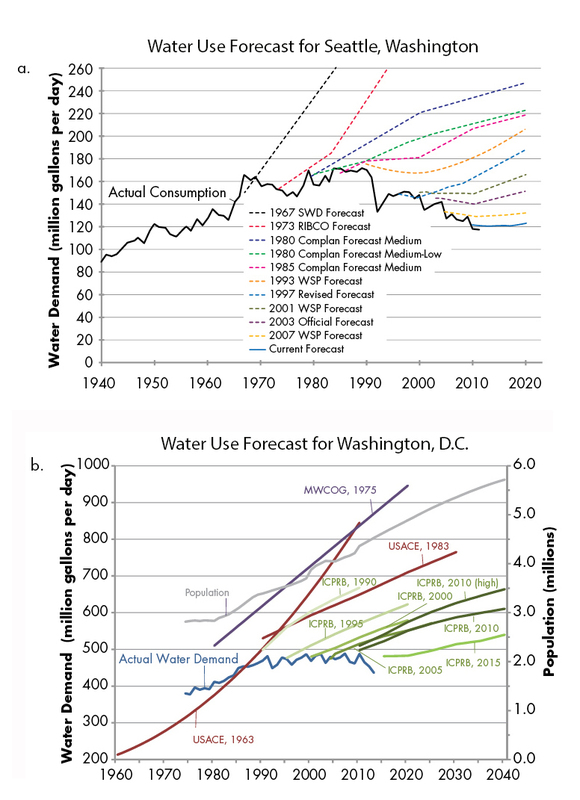 The figures below show a history of past forecasts for water utilities serving two large American cities, Seattle and Washington, D.C. The colorful lines show how past forecasts predicted ever-growing water use. Yet, actual water use failed to reach the expected levels. Indeed, in both cases, water use leveled off and then declined despite continued population and economic growth. In Seattle, for example, water use exhibited a downward trajectory between 1990 and 2013; during that same time period, the city grew by 20%, adding 140,000 new residents. Figure 1. Actual and projected water use in (a) Seattle, Washington and (b) the Washington, D.C. area. The same pattern has emerged in other communities and cities across the U.S. For the last three decades, urban water use in the United States has undergone a profound transformation due, in part, to improved water efficiency, as well as structural changes in the American economy. The practice of water demand forecasting, however, has been slow to adapt to these changes, and as a result, water suppliers are likely to overestimate future water demand. How can water supply planners develop more realistic projections? The good news is that there are a range of practices for improving forecasts. These include accounting for water conservation and efficiency improvements resulting from new building and appliance standards and rising water costs; capturing changes in economic activity, such as a shift from a more water-intensive manufacturing economy to a less water-intensive service-oriented one; integrating expected land use changes, such as denser developments with less outdoor landscaping, into forecasting; and examining the effects of climate change on future water demand. A key limitation for making these improvements, however, is the absence of good data and methods for integrating them into demand forecasts. There is a lot of buzz these days about how big data and analytics are revolutionizing business and government. When it comes to our urban water systems, the data revolution can’t come soon enough. Data on past and current water use can help illuminate current trends and reveal the underlying forces affecting water use. Likewise, data on the current mix of water-using devices in homes and businesses and the rate at which customers are adopting new, more efficient models can shed light on future water use. In addition to good data and methods for producing forecasts, the process for developing forecasts is equally important. There is tantalizing new evidence that forecasters make more accurate predictions when they gather information representing a range of different viewpoints. Philip Tetlock, a political scientist at the University of Pennsylvania, has found that the best forecasters are not necessarily those with the most expertise or even intelligence. Rather, the best forecasters are dogged in their pursuit of facts and seek to incorporate information from a variety of perspectives, even when these contradict their own beliefs. In his 2015 book Superforecasting, co-written with Dan Gardner, Tetlock entertainingly tells the story of how a team of laymen won a Defense Department sponsored forecasting tournament, often making better predictions about geopolitical affairs than CIA analysts with access to classified information. Likewise, water supply planners can invite input from a range of perspectives. Of course, water managers possess a great deal of knowledge about the communities they serve, and this expertise is important in forecasting. Nevertheless, predictions can be greatly improved when forecasters go out of their way to seek out ideas and opinions from a range of viewpoints. It is in this spirit that my colleagues and I have published A Community Guide to Evaluating Future Urban Water Demand. This guidebook seeks to demystify the art and science of forecasting and to provide ordinary citizens with the tools to understand and evaluate utility forecasts. We believe that there is an important role for community and environmental groups to play in water planning. Forecasting is often used to justify big infrastructure projects that have a major impact on the environment and everyone in a community. In brief, forecasting is too important to be left to the experts.